I've had a real hankering to make florentines for a while now. I don't know why it happens but I just get this insatiable need to make this or that which doesn't go away until I get it out in the kitchen. Why florentines? Who knows. Next week it will be something else! After researching recipes online, I chose this one on the Channel 4 site, although for this batch I lightly toasted 50g of mixed cashews, walnuts and hazelnuts and I used 40g of raisins, chopped up finely in place of the glace cherries. 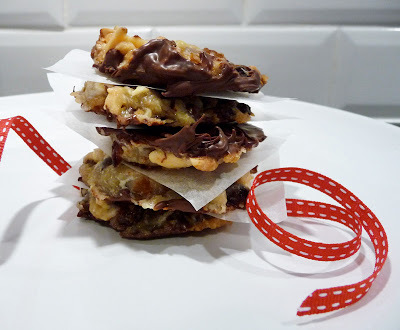 I prefer dark chocolate so used that instead and had jolly good fun applying it to the backs of the baked florentines because I am a total saddo that gets satisfaction from these simple little pleasures. One thing I found out is you can cheat the shape of your florentines if you get them straight out of the oven by pushing the edges gently with a spoon, whilst they are still molten hot. Just don't tell anyone. The very second I made these, I had the urge to remake them with pistachio (yeah, yeah I'm obsessed) and chili. Watch this space.